I have often been a carsharing optimist. But I am also often frustrated at the seemingly slow rise of the industry. In Singapore (where I live) for example, carsharing faced decline over several years, although it may now be reviving. So it has been nice to see a spurt of carsharing good news recently. 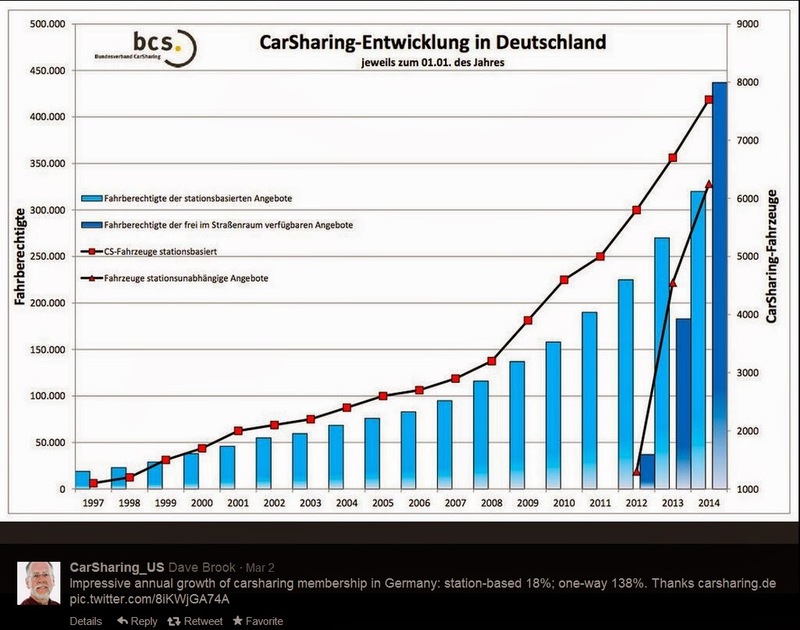 First, news from Germany's Bundesverband CarSharing via Dave Brook on twitter that carsharing continues to boom in Germany. Most strikingly, there is spectacular growth in one-way carsharing (the dark blue columns). Dave writes the Carsharing.US blog. And today I see that a recent report by business advisory firm AlixPartners suggests a much larger than expected effect of carsharing on car purchases, at least in the leading USA cities for carsharing. According to the study, which surveyed 1,000 licensed drivers in 10 developed metropolitan car-sharing markets in the U.S. and 1,000 drivers nationally as a control sample, car sharing in the 10 key markets appears to be displacing vehicle purchases at a rate of 32 to 1 (one car-sharing fleet vehicle displacing 32 vehicles that would have otherwise been purchased). That’s more than double the rate of many studies that have focused only on national averages. To date, according to the AlixPartners study, approximately 500,000 vehicle purchases nationally have been avoided due to car sharing. In addition, the study suggests that as car sharing grows in popularity, it could account for approximately 1.2 million more purchases avoided through 2020. Finally, here is a slideshow offering great clarity on the various 'shared-use mobility options' and how they might come together as a coherent alternative to owning a car (something I have enthused about before).